For a preview of all the new Champions check our facebook page: www.Facebook.com/TitansTactics. Want more about Titans Tactics? Basic and tournament rules are available under the Rules tab. Reviews are available on our Media page as well as on Board Game Geek. Want a copy? Click Buy! 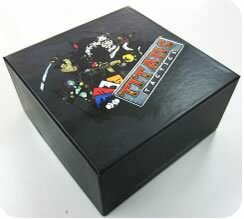 'Titans Tactics' is a fast-paced 2 player skirmish board game designed to deliver deep strategy in 30 minutes or less. Lead Factions of Dragons, Angels, Pirates, Monsters, or Undead Soldiers into battle against your opponent in a race to become the most powerful Titan. Factions contain six Champions, each with unique skills and abilities. Every game Players choose three of the six to fight in the arena. Champions can take and deal damage but cannot be killed, and zero sum scoring determines the winner. Clever and tactical use of their Champions will allow a player to claim victory. Players manage their Champions' abilities via their hand of Skill Cards, spending them to sling fireballs, backstab their enemies, charge their foes, and teleport with ease. With no random elements, tactical play shines though. Thinking and planning ahead is highly rewarded. Titans Tactics comes complete with the 5 Factions' 30 Champions ready to be lead into battle, along with the arena board, Skill Cards, and tokens needed to get in and get playing. Pick up your copy of Titans Tactics now!